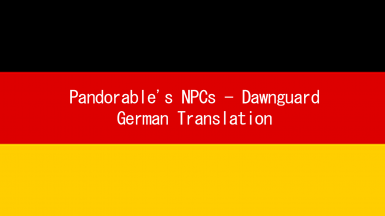 jonas2223 changed some attributes to Pandorable's NPCs - Dawnguard - German Translation: File 'Grey face fix SE - German' category changed to Optional files. jonas2223 changed some attributes to Pandorable's NPCs - Dawnguard - German Translation: File 'Pandorable's NPCs - Dawnguard SE - USSEP' changed to 'Pandorable's NPCs - Dawnguard SE - USSEP - German'. jonas2223 changed some attributes to Joy of Perspective - German Translation: File 'Joy of Perspective - German' version changed to 2.0.2c.